The Vudu guys mean well. They want to make my movie-watching experience at home as enjoyable and convenient as possible. And for that I am thankful. But as wonderful and promising as Vudu is, it’s still just another way of getting movies onto my television in the living room. 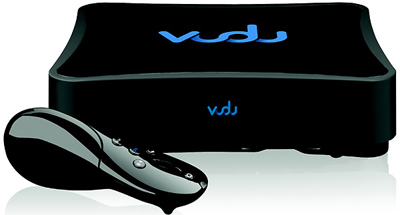 The Vudu solution is a set-top box that can deliver approximately 5,000 movies for instant viewing. One of its selling points is convenience: I don’t have to drive to Blockbuster, only to find the movie I want not available; I don’t have to wait a day or two for the mailman to deliver my latest Netflix movie; I don’t have to rummage through lean pay-per-view and video-on-demand catalogues to find something to watch; and I don’t have to wait for video to download to a computer to transfer to my TV. But you do not have to purchase the movies. Vudu has an agreement with all major studios and a bunch of independents to deliver about 5,000 movies to the set-top box. You can rent movies — and this is the good part, view them instantaneously — for 99 cents to $3.99 but you only have 24 hours to watch. If you prefer, you can purchase movies for $4.99 to $19.99; these are stored on the Vudu hard drive. Vudu is not storing 5,000 movies on the set-top box, and it’s not housing the movies on their servers for downloading. 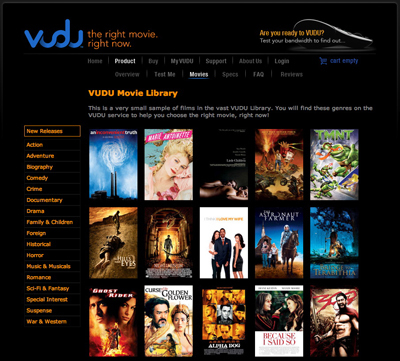 Instead, Vudu uses peer-to-peer technology that is completely transparent to the users. Vudu holds only the first 30 seconds of each movie. While you watch that, the rest of the movie downloads seamlessly in the background. The transfer from starter clip to the rest of the movie is undetectable, according to those who have tested Vudu. What this means is that Vudu gets movies during phases 2, 3, and 5, so some movies might appear on the set-top box but then disappear during the HBO and movie channel phase. Pogue notes in his test that 41 out of 50 movies from Formovies.com‘s Current Top Rentals are available (including “300” and “Blades of Glory”) but only 10 out of 50 on Moviefone’s “Best of 2006” list are on hand (missing is “Dreamgirls” and “The Departed”). Other issues that Vudu faces are: Some people may think the movie box is too expensive; and do consumers want another set-top box? And while broadband is in more homes now than ever before, you still need a stout, fast Internet connection (preferably wired) for Vudu to work well. While I’d like to see Vudu succeed, I’m skeptical. There’s no one-size-fits-all solution to download movies into the home — at least not yet. And there may never be one because no solution can anticipate what you want to watch when you want to watch it and have it available. In the end, Vudu’s success will depend on you, your movie watching habits, and your desire for convenience. Vudu will work for some, but not for others.